Available for the first time in nearly four decades, the recorded works of British psych band Infinity resurface thanks to Lion Productions, who reissue this twelve-track collection complete with revealing liner notes and photographs from the band's heyday. A (perhaps unexpectedly) fascinating insight into the life and works of a largely unknown band from a period in music history that seems all-too distant. "Legendary UK psych outfit Infinity formed in 1969 from the ashes of "Chocolate Soup" psych faves the Flies and Cymbaline. The mission: to develop a heavy psychedelic/pop sound, and express it through complex original songs. Thanks to some funky Hammond organ, punchy guitars, and the band's unique harmonies, Infinity were no run of the mill outfit. Upon their return to mainland England from a residency in Jersey, they joined the high-profile NEMS agency, alongside heavy hitters like Pink Floyd, Tyrannosaurus Rex, Soft Machine, and Pretty Things. 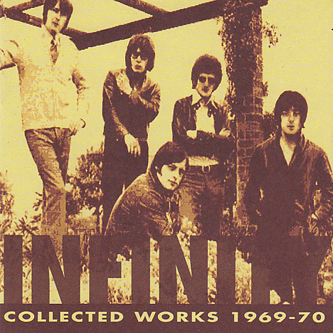 In late 1969 and early 1970, following support slots with The Searchers and Marmalade, Infinity recorded original material for a proposed album, which was meant to explore "time, space, matter, energy and chicken phal, said in some circles to be so hot in a culinary sense that it's temperature approached infinity," or so they have said, with tongue-in-cheek, we have to believe. Sadly, they broke up soon after the sessions. The good news is that the band left behind the recordings presented on this disc, which can now be enjoyed in the digital format after the passage of more than four decades! Comes with a 24-page booklet which includes band history, photos, and more, printed on FSC recycled, chlorine-free, 100% post-consumer fiber paper manufactured using biogas energy."